So last week I was at my favorite place on earth in the afternoon for their feature, Shiner Sunday. The extremely talented talent was Zane Williams. Zane had been doing a particularly nice job and he was even playing through the natural sounds of the area. The weather being habanero-fire-ant-bite hot was causing us, nay forcing us, to drink lots of beers. Zane really went above and beyond. He played past the simulcast air time on KHYI, he played a bonus set with the band, and then he played a bonus-bonus set solo as the sun started to set. When we went to leave I did a sobriety check on the breathalyzer and found that I was a .09%. The wife was a .10%. Every time I tell anyone I keep a breathalyzer in the car I always get asded about the details of my DUI. I’ve never gotten a DUI. I got a breathalyzer to forfend the taxi with the white door that takes you directly to the hoosegow. So even though we felt fine we’d rather be safe than hoosegowed, so we went on a little walk down parking lot lane. 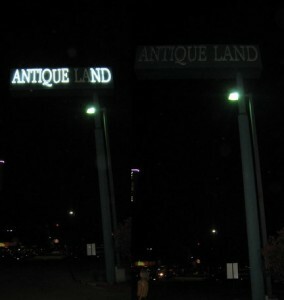 As we ambled I noticed at the base of one of the large signs that shines like a beacon over the highway a little light switch. Not any fancy heavy duty light switch, but just a household light switch with no cover. It’s about 3 feet from a car door when the parking lot is full. I thought there was no way this is what controls the sign. Those things have locks or are controlled inside or something. At the very least it takes some heavy duty switch, this isn’t the bulb in the attic after all. There are certain things that just bring joy to your life and you can’t explain it. This was one of those things. We were giddy. We immediately had to check all the signs. Each one was similarly fool-proofed. Luckily a fool had found it. This was one of the fancier ones, the cover hadn't fallen off. I had never noticed these switches before. One of them didn’t even have a switch. 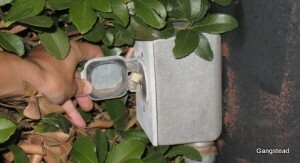 It had an open hole where a plate had been once and a rats nest of wires poking out. I wasn’t touching that. One of the things I learned getting my Electrical Engineering degree was “don’t stick your hand into a rats nest of live wires.” I’d hate to be the Hooters employee who turned off the sign every night. There were already some letters out. We just made the sign consistent. Last call for soup and bread sticks. 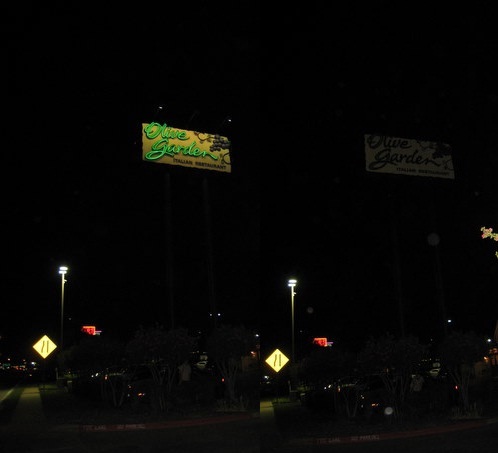 For the record: we returned all signs to their original state and the lights were off for only a second or two. 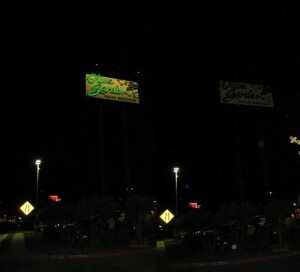 I don’t want anyone thinking that some trucker didn’t get his 10PM alfredo fix because we darkened the Olive Garden. We were sadly unable to relight the LA from ANTIQUE LAND, but that was out before we got there, and the store had a permanently out of business sign on their door anyways. I guess these business don’t need crazy security for their signs because A)No one even bothers to notice and B) By flipping the sign off and on we exploited that find to the maximum possible extent. Darn those punk kids who lowered our carbon footprint. Darn you all! It was a good way to kill a half hour and when I got back to the car I blew a .075 BAC and was confident in my ability to drive home.